I can’t believe it’s already the second half of March – where is the time going? The past week has been great. On Saturday morning Ashley, Elizabeth and I went to Loreto to go along on their weekly trip to the villages. 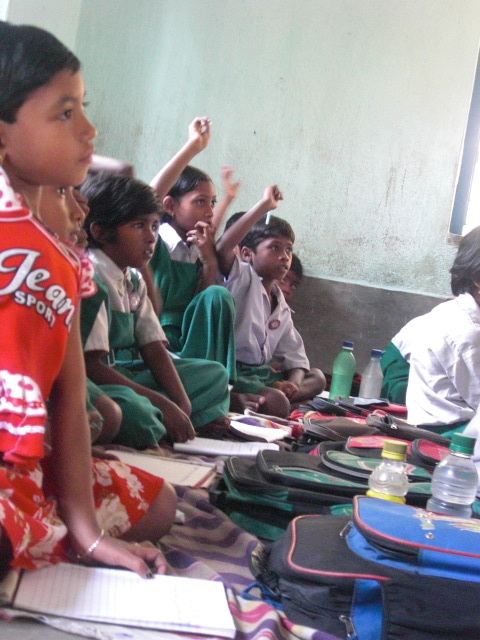 Every Saturday, the older Loreto students (around class 7 and 8) go to nearby villages to teach. We had about a two-hour bus ride to the villages, and the whole ride I talked to a group of 4 girls in class 8 who were in charge of leading me around. 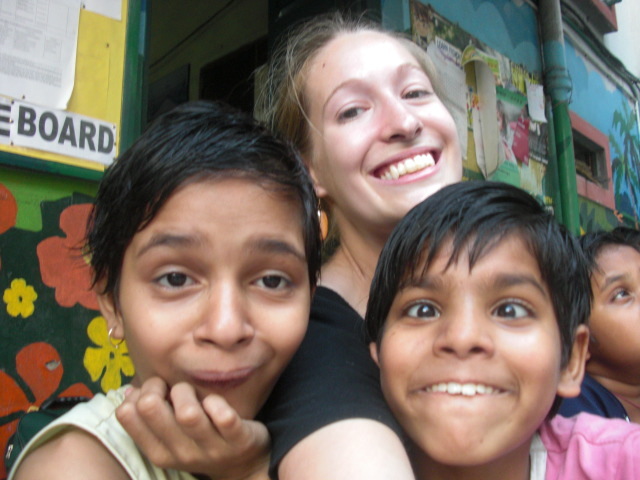 They were very cute and very interested in me and how I’m liking India. 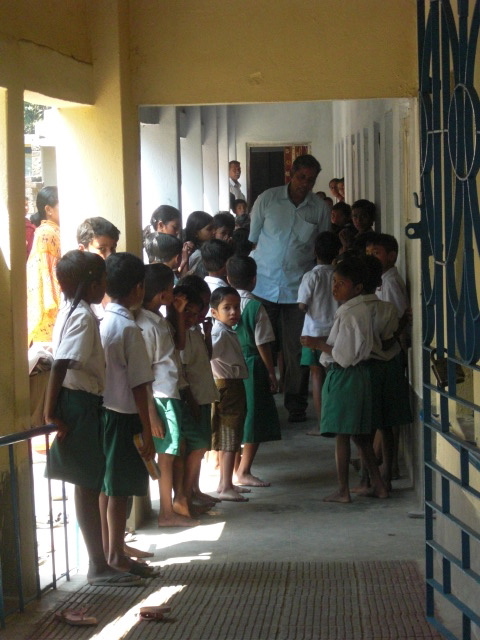 The school in the village was more than I was expecting – a huge building with several classrooms for many different ages. The facilities were quite nice – I’m not sure what I was expecting, but I can tell how much my standards have changed from home…this was a great school but it didn’t have electricity or desks for the students. 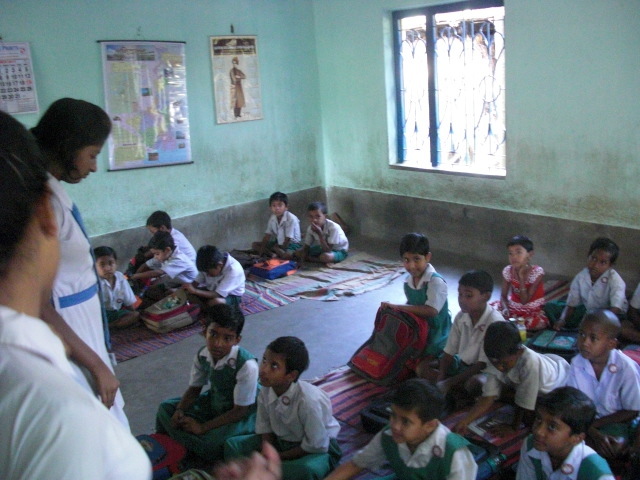 The girls I was with took charge of a class 3 classroom of about 25 students. These students didn’t know any English – not more than numbers 1-10, so I wasn’t able to help very much since I’m at about the same level in Bangla. The girls were pretty good teachers, but some of them were more interested in talking to each other than teaching the class. I watched most of the time since I couldn’t do any teaching, but I often felt more like a distraction than a help since the students would focus on me instead of the lesson. It was still great to see. It was definitely worthwhile for me to go, but I don’t think I will go again since I felt almost more of a hindrance than a help. 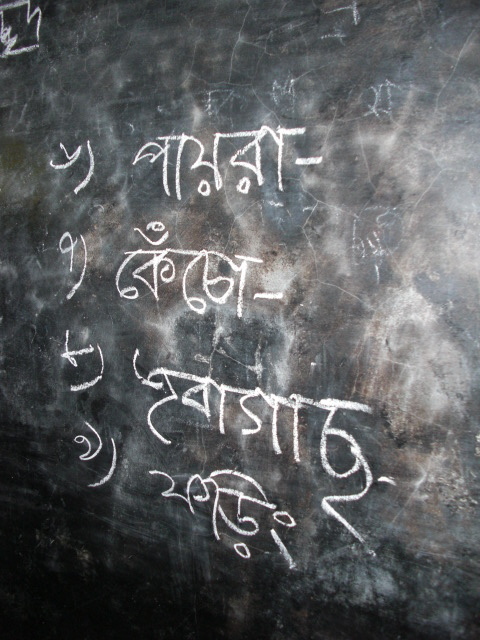 Bengali on the chalkboard - all I can identify are the numbers at the left. 6 (choy), 7 (shat), 8 (aat) and 9 (noi). Sunday was a relaxing day at home doing homework, and I watched the movie Food, Inc. I loved it – and it was very similar to the book I just finished, The Omnivore’s Dilemma. The author, Michael Pollan, was in the movie and so was one of the farmers he visited while writing his book. I’m learning so much about our food system in America – the good, the bad, and the ugly. I can’t wait to learn more! Next on my reading list will be Fast Food Nation by Eric Schlosser. We didn’t have class this week since it’s mid-semester exam week for all the St. Xavier’s students. We only had one exam to study for – our elective course at St. Xavier’s, so for me that is Sociology. Since we didn’t have class on Monday, I had the whole day free but I made some productive use of it by going to St. Xavier’s to study in the air-conditioned library without distractions. I went to Loreto afterward, and I’m slowly but steadily enjoying my time there more particularly because I’m starting to build relationships with the girls. One of the girls, Durgi, is becoming more attached to me each time I come. She gives me a huge hug every time she sees me and makes sure to ask when I’ll be coming back before I leave. She even made me a really cute drawing and poem about how we are friends and she loves me – how cute :) I took out my camera to take some pictures of her and another girl, Parveen, but they became very rowdy once the camera came out. It was very hard to get them to calm down afterward – they were climbing all over me and yelling and stole my shoe as I was trying to leave. It started to wear on my patience, but I’m constantly reminding myself of how much these girls are really desperate for the attention. I came home for a nice relaxing yoga session before our big night of switching rooms! Elizabeth and I share a bedroom here and so do Ashley and Brynn – but one room is much bigger than the other and also has desks for studying so we wanted to switch rooms so everyone had a fair chance to live in the bigger space. I’m enjoying the smaller room so far, though I’m still adjusting to sleeping in a new bed. Tuesday was a great day – we went to the Cricket World Cup! Madhu tried to get us tickets to a game with India playing, but that didn’t pan out so we got tickets to a South Africa vs. Ireland game. South Africa is one of the top cricket teams in the world so I was really excited to see such a world-class team play, as well as go to my first world-level competition! I met up with everyone at New Market to walk to the stadium, Eden Gardens (which is one of the biggest stadiums in the world!). There was really strict security – no cameras are allowed, nor are plastic water bottles (apparently the fans would throw the bottles onto the field?). We were there a little while before the game started, and we had plenty of time to find our seats which were fabulously placed in the lower tier so we were really close to the field. It was incredibly hot at the beginning sitting in the full sun when Kolkata already regularly reaches 95°F. They don’t really sell water in the stadium either…they give you 3 little plastic pouches of water with your ticket though, and it’s the worst packaging possible. You just have to rip the corner of the bag, which spills water everywhere and the little plastic cups you could use to drink the water didn’t hold the whole bagful. Stupid. It was great to relax with everyone though – I felt like I should be at a Twins game at home! I felt like I could be in America, and really wanted the typical American sporting event snacks that go along with it – popcorn, pretzels, nachos, etc. but instead there was Indian snacks like papri chat and egg rolls. Watching the game was great – I didn’t know much about cricket going into it but luckily Vinayak sat near me and he explained whatever questions we had. I have a solid understanding of the basics now, so I could at least follow the game. People will often say that cricket is like baseball, but if someone tells you that just don’t listen. Cricket is not like baseball except that someone throws a small ball, someone hits it with a bat, you run, and someone tries to catch the ball. It was a lot of fun, but we didn’t stay for the whole game. It started at 230pm and was scheduled to go til 1030pm, but we left around 730 – turns out Ireland didn’t do so well at bat, and South Africa won by 131 runs. The form of cricket used for the world cup is one where you play 50 “overs” – an over is 6 balls – and there are only 2 innings. One side will bat for the first inning and one will field, and they switch for the second inning once either the 50 overs are finished or all 11 players of the batting side are out. The traditional form of cricket lasts for 5 days! I’m looking forward to learning more about the game and to watch Vinayak in a match! Wednesday was the day of our exam. We left quite early so we arrived with about an hour to spare before our exam began. We had heard from Kia, who took her exam on Monday, that it’s confusing trying to figure out where you have to go so we wanted to get there in plenty of time. We went to the office to ask which room we would be given the exam, and turns out the administration didn’t even know we would be taking the exam! Apparently the departments didn’t notify them we would even be taking the exam, so we were not included in their very elaborate seating chart which separates each class into different classrooms and specific assigned spots to take the test. They put us all in the same room. Luckily the exam was not difficult – I had prepared enough so the questions were very straightforward. The kind of exam that is given here is an essay exam where you have to write down basically everything you had memorized from the notes the professor dictated in class. It’s very much a kind of regurgitation of information – and I’m glad I only had the one exam to study for, unlike the rest of the St. Xavier’s students. I’m glad it went well, but now we’ll have to see how they will be grading us. We’re not sure how the grade conversion will work, or how the professors will grade our papers since they know we are not Sociology majors and that we have had no background in Soc. or India before coming here. After the exam, we met a few of the visiting CSB/SJU professors – there’s a group of about 7 professors who are visiting from our campuses to help assess how the program is going and also to introduce more faculty to the India program so there may be potential future program directors from this group. Elizabeth, Ashley and I went to Loreto afterward which was okay. We showed up at a time when there were very few students, but I spent the time with Jhuma and Durgi. 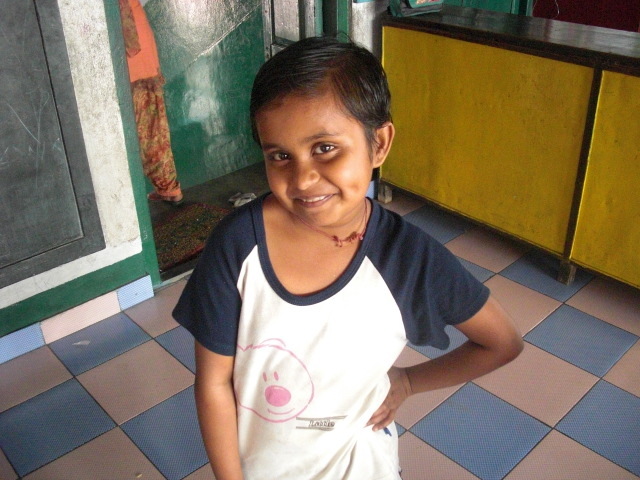 Jhuma thoroughly enjoyed combing and braiding my hair, and I helped Durgi with a little homework. That night, we met up with our visiting professors at a great Chinese restaurant called Bar-B-Q. It was a wonderful dinner and it was SO nice to talk to them. I miss campus a lot so it was nice to talk to someone from there, and it was even better to talk to someone outside our group who really understands how different home is from here. They much better appreciate the joys and frustrations we have here, and they were very keen to listen to us describe our experience and to hear all our feedback, both positive and negative. I’m optimistic that this group will seriously consider our negative criticisms and will take action to help make this program better and more established in the coming years. Another post, another reflection…this time it’s about beggars. When I decided to come to India, I knew I would see poverty like I could never imagine. I knew I would see beggars and I knew I would see slums. I knew, but at the same time I didn’t know that seeing this would affect me the way it has. At home, there is most often a clear division between a well-off neighborhood and less wealthy neighborhoods – you may be driving along in a rich area and as you drive the city slowly changes into less privileged areas. There is a very clear distinction and physical separation of these areas. Here in India, it is not like that at all. There is no clear division between wealthy areas and impoverished areas – you may be walking along next to a giant beautiful fancy hotel and within the next 20 steps, you find yourself walking through a slum. For such a long time, Calcutta was the West’s image of human despair and suffering and today there are still many examples of suffering. It’s hard to see such abject poverty – there is a slum area right outside my house and I walk by so many people every day who literally have nothing. There are so many homeless people on every street, and beggars at every corner. It’s hard to see this poverty – it’s emotionally draining and results in an ethical/moral dilemma. The hardest part of seeing this poverty is to see the vast majority of indifference to it. People walk along without even noticing the beggars or the homeless and ignore them when they are approached. I understand now how or why there is such an apparent indifference – if you became emotionally invested in every person that approached you on the street, you simply would not be able to function. It’s certainly easier to just walk by them. But is that even the right thing to do? How can we walk along so involved in our own lives that we ignore the humanity and suffering around us? I’m surprised at how quickly and easily I’ve become desensitized to the poverty, and a bit ashamed. I can honestly walk down a street and not give a second glance to the dirty woman and malnourished child huddled in the corner on a piece of cardboard. It’s also hard to know that they seek me out specifically because I am a foreigner. When I’m approached by beggars, I never give money. I have no idea where that money is going, if they will actually use it themselves or if it will be given away to someone else or spent on unnecessary things. I give food when I can, and unfortunately just say no and sorry to everyone else. There was one incident that really stuck with me the other day – on Tuesday, when I was in New Market. New Market is a very popular shopping area where you can find almost anything in a great selection and bargain your price down to something reasonable. I like going to New Market, but I hate how hassled I am there. Vendors and beggars follow me around constantly, and they are very persistent. While Elizabeth and I were standing trying to figure out where to meet up with the group, an older woman with a baby in the crook of her arm approached me. She was following us/me, saying “didi, auntie (terms of respect here)…help…please, no money, milk for my baby…”, touching my arm, etc. She was very difficult to ignore – and it’s really hard to say no to someone when they are asking for some real thing they need and not money. I was stuck so uncomfortably in this ethical and moral dilemma – do I give her money? Do I buy her the milk? Do I just ignore her? And I hate that I feel like I have to be suspicious of their motives – is she seeking me out just because I’m a foreigner? Is that even her baby? If she was really desperate, wouldn’t she be asking everyone else? It feels awful having to judge someone’s motives when they are clearly in desperate need. I hate knowing that I’m targeted and that they are relying on manipulating my emotions – and should they? Do they have that right? I’m always so self-conscious when I take out my money to pay for something, because then they (whoever they is) can see how much money I actually have. Whenever my wallet comes out, that’s directly where their attention is focused. I can’t be giving out money all the time. I may have a lot of money by their standards but I’m still a poor college student with a lot of student loans and not a lot of money will be coming in this summer when I have to pay for things in U.S. dollars again. But still – I know I can always get more money through some way or another, even if that money will be in the future when I have a salaried job which I am so privileged to be able to rely on and plan on having. So when I ignore the beggars, I just feel like such a cold-hearted person. In the end, we did buy her the milk for the baby, and she did seem appreciative or grateful. I did notice that her attitude changed immediately after we said yes though – it was like she had assumed the position of power and became very confident, she was triumphant. I just hope she actually uses it. I wish there were easier answers for this dilemma – there seems to be no answer as to what is the “right” thing to do.